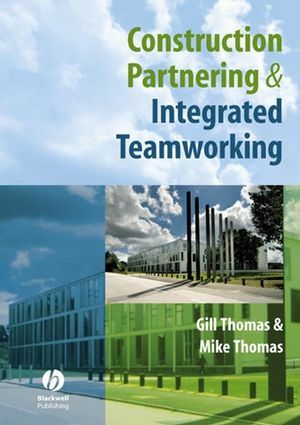 If you are implementing partnering in your organisation and don’t know where to start, this book covers everything you’ll need - explaining all aspects of the partnering relationship from scratch. With its accessible and practical approach, Construction Partnering & Integrated Teamworking trains you in the essential elements of partnering. Since setting up Mike Thomas Ltd in 1997, Gill and Mike Thomas have facilitated more than 400 project and strategic team workshops including partnering, value and risk management, post-project reviews, team-building and best practice training. Chapter 1: The Culture Change. Chapter 2: Identifying the oorganisations’ Value Criteria. Chapter 3: Partnering Advisers and Facilitators. Chapter 4: Internal Partnering and Managing Change. Chapter 5: Selection Criteria and Weighting. Chapter 6: Selecting Supplier Partners. Chapter 7: Writing Effective Partnering Documentation. Chapter 8: Evaluating Client Partners. Chapter 9: Submitting Successful Partnering Bids. Chapter 10: Assessment, Evaluation and Award. Chapter 11: Developing the Integrated Team. Chapter 13: Respect For People. Chapter 15: Non-Technical Team Roles. Chapter 18: Partnering Champions and the Core Groups. Chapter 20: Benchmarking and Key Performance Indicators. Chapter 21: A Programme Of Partnering and Integrated Team Workshops. Chapter 22: Initial Partnering Workshop. Chapter 23: Continuous Improvement Review. Chapter 28: COLA – The Cross Organisational Learning Approach. Chapter 29: Implementing Best Value. Chapter 31: Whole Life Costing. Chapter 33: Open book accounting. Chapter 34: Incentives and Award. Chapter 36: Involving Interested Parties and Inducting New Staff. Chapter 37: Avoiding the Pitfalls of Partnering. Chapter 38: Icebreakers and Team Building Exercises.